Goal-setting is a wonderful tool to use in all areas of life, including baseball. Goal-setting has unquestionably been proven to provide great results in most cases in comparison to not setting goals. Unfortunately, most people set goals incorrectly when it comes to athletics. This traditional goal-setting can actually hinder and limit what you're capable of. While those are incredible stats, they depend on a number of factors out of your control. If you're not setting goals, now is the time to start. Whatever situation you may be in, here's exactly how to set goals in order to increase your chance of success. Make each goal time-bound and measurable. Make sure you are in complete control over each goal. So instead of saying "Goal #1: Hit .300" - ask yourself "What would it take for me to hit .300?" (let's assume you're currently hitting .280). Would it take 15 minutes of extra batting practice per day? Or maybe 10 minutes of tee work after each practice? Or if you have trouble hitting the curve ball, maybe 15 minutes of hitting curve balls each day would help? I hope you can see where I'm going with this. While "hitting .300" is a wonderful milestone, it's hard to have control over and should not be looked at as a goal. You may get robbed by a great defensive play, even if you are hitting line drives all over the place. Goal #1: Take 15 minutes of additional batting practice per day. Goal #2: Take 10 minutes each day to work on proper "power" batting mechanics such as loading, unloading and generating force from within. Goal #3: Perform a minimum of two—and a maximum of three—strength & conditioning workouts each week in order to stay healthy, strong and injury-free. These goals all follow the four rules and allow you to take control of and responsibility for your actions. In addition by sticking to your goals, you'll improve automatically as your work and practice will lead to increased success and performance. I suggest you go set a few goals for this upcoming season NOW. It's easy to put off until "tomorrow", but there's no better time than the present. Happy goal-setting and here's to your best season ever! Find a baseball camp to take your game to the next level. Jon Doyle MA, CSCS is considered the world's foremost authority on baseball training. His training techniques have been used by over 500 MLB players, 28 MLB teams, 400 NCAA programs and tens of thousands of High School and youth players to gain a significant advantage of their competition. 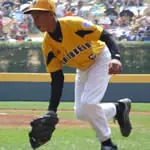 His website, BaseballTrainingSecrets.com , is the most visited site of its kind in the world.